Volume Six - Pre-Victorian to the Present Day - Select Aspects - The subway under the river Ely story . . .
"Alan Thorne tells the extraordinary story of what happened in the latter half of the 19th Century when Penarth, and Penarth Docks in particular, came alive thanks primarily to the great engineer Brunel and the booming trade in Welsh steam coal as increasing numbers of people had to get back and forth across the Ely. 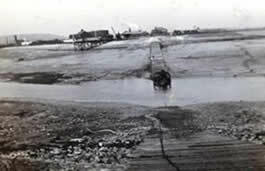 Until the 1850s the present site of the Cardiff Bay Yacht Club was one long, eastwards pointing, mud promontory. It was covered at high water and exposed at low water. A Parliamentary Act passed in 1857 authorised the construction of Penarth Dock. The Harbour opened in 1859 and the Dock in 1865, which meant that some sort of communication now had to be established between the Cardiff side of the Ely and the new docks. The first ferry started in 1857, a small steam paddle steamer owned by a Mr Clements. It was not a very promising enterprise. 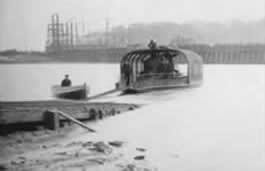 Twelve years later, in 1865, when Penarth Docks opened, the dock company introduced a cross-river, steam-driven, chain ferry worked with a crew of two. These two pictures were taken in 1898 when the chain ferry was about to finish.